and way beyond our capabilities! I'm writing this tail tale on Saturday because after our long walk, and because it was such a lovely evening I just never got round to tapping any keys yesterday! The little blue marker marks our campsite, so as you can see we're right between the North Sea and the Ringkabing Fjord, and really it would be hard to think of a more beautiful spot! We're a hop skip and a jump away form the ocean and in the evenings the red orb of the sun sinks over the sand dunes behind us and then plunges into the sea. Additionally, the site is very quite at this time of the year so all in all we seemed to have picked a very tranquil couple days. However, as usual, we couldn't sit still!! So on Friday we packed our picnic and walked for about 4 miles along the beach in a southerly direction - but we could have gone much further because the beach stretched in front of us for as far as we could see. Apparently this coast of Denmark offers unspoiled coastline in both directions for more than 500 km, but the North Sea is fickle, so although it looks idyllic the windy beaches are often battered by huge waves and rip tides are an ever present danger. But that didn't matter to us because we'd no intention of getting wet - although the incoming tide did chase us up the beach on more than one occasion. After 4 miles we paused for lunch and then turned back towards the campsite, but instead of the beach we chose to walk through the dunes, and that was almost as picturesque with it's wind tossed lyme grass, rock roses and purple heather it often looked just like an artist's palette. And here the walking was easy because it was along one of the many cycle trails that crisscross this area. By the time we got home we were more than ready to put our feet up for a while, so the late afternoon was passed chattering and sitting in the sunshine with a nice cool beer in our hands. On Saturday we decided we wanted to explore a little further afield so out came our bikes and we aimed them for the town of Ringkobing which is just below the top curve on the map above. On the way we stopped of in the town of Hvide Sande which is home to the main entrance to the Ringkobing fjord via 2 piers that lead into it from the North Sea. It is also here that a sluice system can be found which was built in 1928 and to this day still controls the amount of water within the fjord, and we got an excellent view of the system by climbing to the top of a view point that used to house a German observation bunker. After that we found ourselves crossing more heath land which led us past the Lyngvig lighthouse and then onto a new bicycle path that was built a couple of years ago across the remnants of the historic Bagge's Dam. The Dam originated in 1865, but now it provides a lovely trail across the shallow waters at the northern end of the fjord, and much to our delight, about half way across the 2 km track we found a pretty picnic spot to stop at for lunch with the gently lapping waves of the fjord on both sides of us. Soon after that we were in the town of Ringkobing and it was there that we cycled past a very amusing sculpture - it's called Survival of the Fattest! 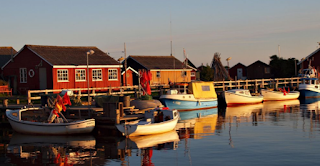 The town itself used to have a direct access to the sea via a strait but this was eventually cut off by moving sand banks so now boats arriving there have to come via Hvide Sande. However, it was still has it's thriving harbour where all sorts of fishing paraphernalia and fish restaurants lurk, and many of the other streets are lined with flower bedecked houses that are inter-spaced with pretty little shops. By now our milometers were showing a little over 20 miles so after a short exploration we were ready to start our homeward journey, and with a bit of turbo power, and because we stayed mostly on tarmacked tracks our second 20 miles was achieved quite a bit faster than the first - but maybe we're getting a bit old because today's 40 miles was more than enough for both of us! Today was a moving day - but not far - only a quick 50 miles, so we were settled in at our new home by lunch time. 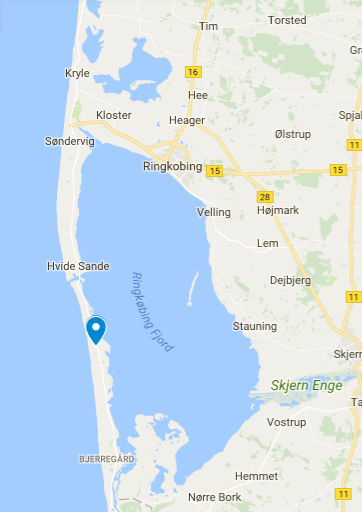 Therefore, after we'd eaten we'd still got plenty of time for an outing to The Wadden Sea Centre, and to get there we cycled along quite roads and track and also part of National Cycle Route 1 which runs for many miles along the Danish coast. Unfortunately our views of the sea were obscured by the Ribe Dyke which is 15 km long and stands 6 meters above the sea surface - a height that was decided upon as it corresponded with the level of the water in a storm surge in 1634! It was built in 1911 and at that time much of the work was carried out manually, but the compacting of it was done by 4 oxen by walking them backwards and forwards several times! The Dyke now protects vast swathes of arable land and many Danish homes from devastating flooding so although we didn't quite see what we expected we didn't mind because on the land side we were treated to striking views over ploughed fields and marsh land where huge birds of prey circled looking for their dinner. But 'Oh Dear' we did get as far as the Visitor's Centre but just before we arrived John got a puncture, so by the time that was fixed it was nearly closing time and certainly not worth paying their £13 admission fee! Therefore, we backtracked a short distance and sat on top of the dyke while we munched apple and sipped coffee, and from there we had lovely views over the sand flats, and more distantly of Mando Island. The island is attached to the mainland via a 6 km causeway but twice a day the tide cuts it off completely, and although it was open while we were there we hadn't got time to cross today. However, we were entertained by starlings 'murmuring' and also lots of other birds paddling on the muddy sand in what is Denmark's largest National Park. This morning we decided to visit the town of Ribe which is the oldest town in Denmark, and arguably one of the most beautiful with it's old cobblestone streets, numerous ancient half timbered buildings and Ribe Cathedral. As usual we used pedal power to get there, but for many miles before we reached the precincts of the town the prominent tower of 'The Church of our Lady' were clearly visible across the flat landscape! The cathedral can trace it's history back to 1150 and at that time there were two towers of equal height on the west side, but on Christmas night 1283 one of them collapsed killing many of the people who were inside the cathedral and it was never replaced. The building sits in a lovely open square that has been recently renovated and is surrounded by lots of alfresco cafes and old hotels that offer all kinds of goodies to eat, so today we broke with our usual picnic tradition and instead enjoyed a meal outside the historic Dagmar Hotel parts of which are more than 425 years old! In times gone by the Night Watchman would wend his way though the winding streets of Ribe and his duties would include watching for fires or floods and keeping order on the streets, but these duties ceased in 1902. However, in 1935 the tradition was revived but only in the summer months - and apparently, here September counts as Autumn so for the time being they've gone back into retirement. After we'd done feeding and exploring the town we started our homeward journey which took us back out to the Ribe Dyke and to the Kammersluse - a lock that allows sailing vessels into a canal that runs to Ribe and beyond. Initially, John had suggested that we should eat at the hotel that is situated on it's banks, but apparently one of the specialities there was roasted eel with potatoes in cream sauce and I'm not sure I could have fancied that! So instead of eating in the hotel we drank our own coffee on the edge of the canal and watched huge fish jumping clear of the water as they struggled against the current to get back out through the sluice gates into the Wadden sea! Then we'd just got `12 more miles to peddle home, but altogether in the last 4 days we've covered 100 miles on bike and foot so what should have been an easy ride turned out to be a bit of a battle especially as a strong wind was pushing against us! Therefore, once again, we were very glad to use the aid that our e-bikes provide! Tomorrow we're going to leave the Danish mainland and cross over to the Isle of Romo but we're very kindly going to give our bikes at least one day off!